Tie dye is a kids' craft classic, and for good reason; it's cheap, colorful, and incredibly creative. Kids can create their own tie dye designs or they can follow specific instructions to dye their shirts in a specific pattern, but no matter what they choose to do, the end result is always totally awesome. In order to get the best tie dye experience, you need quality dye, and that’s where the TULIP One-Step Tie-Dye Kit comes in. The TULIP One-Step Tie-Dye Kit provides kids with everything they need to create their own tie dye masterpieces. The kit includes 3 squeeze bottles, gloves, rubber bands, and a list of project ideas and inspiration, so the only things you need to get started are water and T-shirts. 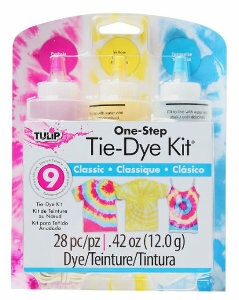 You won't need to pre-soak your shirts before using the TULIP One-Step Tie-Dye Kit, and the color won't fade in the wash once your child’s projects are complete. Plus, kids can easily mix the kit's fuchsia, yellow, and turquoise dyes to create shades of purple, green, or orange for their tie dye projects. The TULIP One-Step Tie-Dye Kit can dye up to 9 projects, so your kids can easily use this kit with a small group of their friends. No matter how you choose to use it, the TULIP One-Step Tie-Dye Kit is truly a one-stop shop for tie dye fun.